Philippa, as a WITI Member, submitted this article to WITI for publication. Do you have expertise to share? WITI gladly accepts submissions for publication! For more information or to make a submission, please visit the Members' Area. The next issue of WITI FastTrack will feature the stories of the amazing women who have been inducted into the WITI Hall of Fame over the past nine years. Show your support for these women by placing an ad acknowledging their extraordinary achievements! The issue closes August 22... Get your ads in today! More information about WITI FastTrack is available here or contact Cindy Zauss at [email protected]. It has been said that the best jobs come from word of mouth. But that's not stopping the thousands of Americans logging on to websites like careerbuilder.com and monster.com, searching for jobs and posting their resumes. The chance of getting a call back is very slim, especially since the average human resources office today is overloaded with hundreds of resumes from other interested candidates. But with no other apparent resources to find work, many are willing to take their chances. Some even invest in fancy resume paper. Yet how much simpler would it be if you had a friend at the company who could recommend you for the position? An inside source who could lead you to the key hiring powers? A shortcut like that could save you valuable time and money in your job hunt. Experts agree that networking is worth your time and effort and can help you get ahead in the professional world. Barbara Clements, president of Auditel Inc., writes, "Auditel Inc. of Florida has grown this past year, and we have opened a new location in Colorado. It is a great experience to work toward a goal and achieve it. With the help of many business referrals we have challenged the phone companies and gained many companies extremely large refunds and monthly savings. "With the opening of our Colorado office, we have roled out a special site visit program to help companies with any doubts or questions on their telephone and telecom bills. Now we provide a one day customer site visit and review of telecom bills. We make recommendations (not change of carrier) to correct telecom tariff and billing errors and these savings can be realized quickly and made internally to save even more money. Telecom contract review and negotiation skills can be learned during day training as well." WITI congratulates Barbara and Auditel on their success! Enlightened Power is a primer for men and women in any field who want to access more efficient and effective ways of leading -- guided by the voices and experiences of 40 female and male thought leaders -- including David Gergen, Pat Mitchell, Peggy Klaus, designer Eileen Fisher, Barbara Corcoran, Marilyn King, Swanee Hunt, Rayona Sharpnack, Riane Eisler, and many others. Please take a look at this standout text, and order at least one copy today for your corporate library. 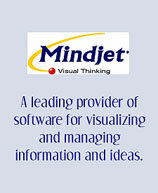 Mindjet Corporation, the leading provider of software for visualizing and managing information, provides applications for business teams to think together, plan together, and work together. Mindjet MindManager, the company's award-winning flagship product with more than 500,000 licenses sold worldwide, is productivity software designed for business professionals working as individuals or in teams at Global 2000 companies. With headquarters in California and operations throughout the world, Mindjet is backed by leading international venture capital firms Investors Growth Capital and 3i. More information is available by calling toll-free 1 (877) MINDJET or by visiting http://www.mindjet.com. Mercury Computer Systems, Inc. provides a comprehensive range of solutions to meet our customers' challenging computing needs. Over the years Mercury has built a solid reputation for understanding our customers' applications and providing the engineering and systems expertise to design and deliver the optimal solution. Offering component-level and system-level solutions that span hardware, software, silicon IP, services, and systems, Mercury has earned the privilege of serving customers across diverse industry segments including aerospace and defense, telecommunications, life sciences, energy, electronics manufacturing, and education and research. Search for Mercury Computer Systems jobs on WITI4Hire. The Enterprise Systems Management organization at Fannie Mae is looking for an Engineer who will be responsible for Providing BEA Weblogic administration and support to several large-scale, production application efforts in Fannie Mae. Hands-on installation, configuration and maintenance of WebLogic 8.1, including troubleshooting production issues, tuning WebLogic performance and deploying application components. Also, develop and document korn shell and perl scripts that will automate tedious administration processes; research, design and documentation of infrastructure solutions for large application development projects; and develop prototypes and explore new technologies in an effort to provide solutions to mission critical development challenges.